From famous writers and personalities who call the city home, whether by birth or simply love, these pieces written in the wake of Hurricane Katrina serve as a timeless tribute to New Orleans. Sentimental, joyful, and witty, these essays by celebrated writers, entertainers, chefs, and fans honor the life of one of America's most beloved cities. 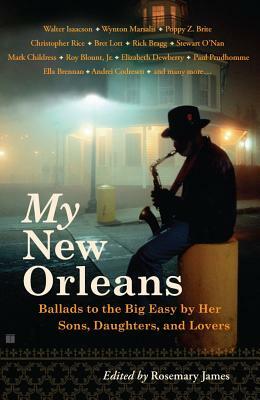 Paul Prudhomme writes about the emotional highs New Orleans inspires, Wynton Marsalis exalts his native city as soul model for the nation, while Walter Isaacson shares his vision for preserving his hometown's pentimento magic. Stewart O'Nan recalls the fantasy haze that enshrouded his first trip to the Big Easy when he was thirty and bowed to Richard Ford to receive his first literary prize. Poppy Z. Brite thanks New Orleans for helping her discover the simple pleasure of Audubon Park's egrets, and Elizabeth Dewberry explores what it means to work Bourbon Street as a stripper. My New Orleans captures the spirit of the city that was -- and that will be again.